The S700X SQUID Susceptometer is the most sensitive instrument for DC and AC measurement of magnetic properties as a function of magnetic field and temperature. Numerous different experiments may be performed with this unique instrument. The SQUID sensor at the heart of the system has an input noise power sensitivity of approximately10-30 Joules per root Hz. This energy sensitivity is 108 better than any semiconductor device and accounts for the instrument's ability to resolve extremely small magnetic signals with accuracy and speed. The S700X has several modes of operation. The most widely used is the measurement of total magnetic moment made by moving the sample through a set of pick-up coils. During the measurement the sample temperature and applied magnetic field are precisely controlled. The second order gradiometer configuration used for the pick-up coils is insensitive to the externally applied field but allows samples of 10-11 Am2 total moment to be resolved with ease. The following competitive features are provided in the basic system package free of charge. To make continuous measurements in a changing background field, we include the Oscillating Mode facility. Under this condition the sample is oscillated vertically over a distance of few millimeters. The detected sinusoidal signal from the SQUID is proportional to the magnetic moment of the sample. The ultra light design of the sample chamber allows fast temperature changes and stabilizes quickly, because there is hardly any heat capacity to overcome other than that from the sample holder and the sample. A second temperature control loop regulates the temperature of sample space tube in order to enhance the performance at higher temperatures. Any temperature within the wide range of 1.6K to 370K can be kept continuously, as long as there is liquid helium in the main reservoir. Based on the experience in the field of Rock Magnetometers, the S600's shield system consists of a mumetal can and a niobium shield, which reduces the background field to as little as 0.5 mG. The system is fully shielded against external noise and changes in the background field. The 16 bit DAQ with software controlled preamplifiers can cope with signals of 130dB dynamic range. An optional range changer widens this span to 190dB. Great care has been taken to make the system as user friendly as possible. The new LabVIEW software provides an open software environment that allows the user direct control of all features of the system with real-time graphical displays of all the relevant functions. The data gained during a measurement are analyzed in terms of magnetic multipoles. This unique feature gives a dipole moment independent of the sample shape and is error tolerant in respect to sample position. A feature which allows inexperienced users to perform reliable measurements. An on-line help feature, which is available at any stage of the experiment, provides support to newcomers making their first measurements and allows advanced users to optimize the system performance according to their requirements. An AC measurement option is available as a complement to the standard DC method to study the magnetic susceptibility of materials directly. We offer the facility to perform direct susceptibility measurements in AC magnetic fields from 10-2 to 500Hz. The magnet is fitted with a separate superconducting coil for the AC field, providing up to 5 Gauss AC field, and is driven by the main system electronics. With this option, the total sensitivity is maintained at up to 10-8 emu in a 1T background field. The standard measurement range (106 total dynamic range) is from 10-11 to 10-5 Am2 can be extended to measure signals as large as 5 x 10-3 Am2. The extender is automatically activated during measurement if the sample moment is above the standard dynamic range. This option may be retro-fitted to an existing insert. An extension of the standard temperature range to high temperature is available using the oven insert. In normal operation, the system has a continuous temperature range of 1.6 to 370K. With the oven insert this is complemented by allowing measurements in the range 200- 700K. Simultaneous multiple axis measurements are possible by the addition of secondary (and optionally tertiary) pick-up coils in the main magnet assembly. This enables measurements of sample anisotropic effects. Included with the transverse axis facility is a motor which permits rotation of the sample, controllable to 0.1 degree. This facility allows simultaneous measurement in two or three axes. A small transverse field (~ 1 Gauss) may be applied using an optional saddle coil mounted around the main superconducting magnet. The saddle winding is energised using an independent power supply. A persistent mode switch is an optional feature. The transverse field option is offered for use with the transverse pick-up coil sets. For some applications it is very important to verify the magnet field at very low applied fields. The fluxgate option allows field measurements within the sample column up to a limit of 20 Gauss with a resolution of 10-5 Gauss. 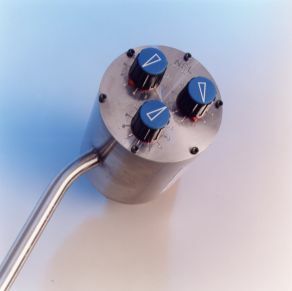 To compliment the fluxgate option, Cryogenic offers the Hall probe facility to enable measurement of magnetic field in the range 0.1 Gauss to 105 Gauss. The software allows magnetic measurements by a continuous oscillating mode moving the sample 2mm to 5mm peak to peak. The signal is detected synchronously and the moment displayed. This method permits measurements to be made without the need to stabilise the background field. The VSM measures the magnet moment by moving the sample between two pick-up coils at frequency of 1 to 100Hz. Sensitivity is to 10-6 emu with a suitable averaging time. The standard temperature range is 1.6K to 325K with fields up to 18 Tesla. A Helium-3 option is available which allows tempratures down to 300mK for some type of measurements. Option 1: Fully integrated Cryogen Free VSM measurement System to 18 Tesla. The VSM measures the magnet moment by moving the sample between two pick-up coils at frequency of 1 to 100Hz. Sensitivity is to 10-6 emu with a suitable averaing time. The standard temperature range is 1.6K to 325K with fields up to 16 Tesla. A Helium-3 option is available which allows tempraturesdown to 300mK for some type of measurements. The pick-up coils are built into the main magnet system . These have the advantage that the coils are at 4K independent of the sample temperature but require a larger magnet with a smaller VTI. 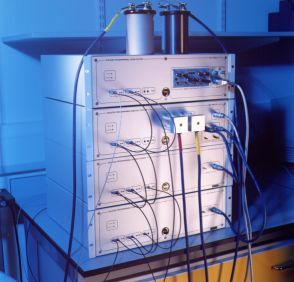 The system would include Helium Free or liquid helium Cryomagnet, Variable Temperature Sample space, a set of special probes which carry the sample, as well all the electronics, computer and measurement software. Option 2: Cryogen Free Mini VSM Measurement System. Cryogenic offers the Mini helium free magnet system with fields up to 5 Tesla for measurements of Electrical, Magnetic and thermal properties of material. The mini measurement system is built around a modular framework with a cryogen free platform. 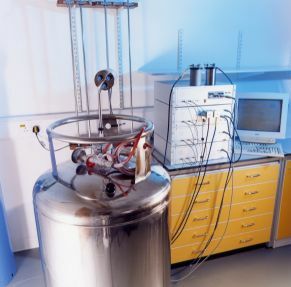 The system consists of a cryogen free magnet (up to 5 Tesla), Variable temperature Insert, two cryocoolers (pulse tube and GM), special probes to measure different material properties, computer, electronics and measurement software. The system is delivered as an integrated turnkey system with installation, training and support. The RnX series measurement systems provide a versatile platform for a wide range of studies into the properties of materials as a function of temperature, time and magnetic field. As standard, these include DC and AC resistivity, magnetisation and susceptibility. The standard RnX series enable measurement of sample resistance in the range of 106 to 10-6 Ohms in a temperature range of 1.6 to 300K. If measurements are required in a magnetic field Cryogenic offers a range of magnets suitable for every need providing up to 14T along the sample access and 8T orthogonal to the sample access. Resistance measurements are made using a 4 terminal probe with drive currents from 1A up to 100mA. The sensitivity of the data acquisition system is 0.1 V to 1000mV full scale. In order to verify each measurement, the system simultaneously measures both the 2 and 4-terminal voltages over the sample. The applied voltage is dynamically reversed in order to subtract thermal potentials, and the measurement averaged. An extension of the standard temperature range to high temperature is available using the oven insert. In normal operation, the system has a continuous temperature range of 1.8 to 300K. With the oven insert this is complemented by allowing measurements in the range 200- 700K. The addition of a precision 4-quadrant low current source (250mA o/p) to the main power supply, enabling precise low field excursions on the sample. The low field range is dependent upon the maximum field of the main magnet. For measurement of very low resistance materials we include the facility to measure down the nano-Ohm resistances. This facility includes a precision nanovolt amplifier and 1A current source. 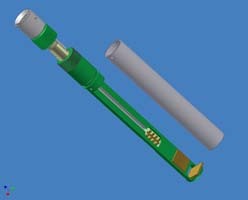 A probe for critical current measurements to 120A for use with high conductivity or superconducting materials. Voltage measurement to 0.1 Volt or better is offered. Specific heat measurements are made for samples with microgram weights using a miniature calorimeter on a silicon nitride membrane with thermometer and heater. 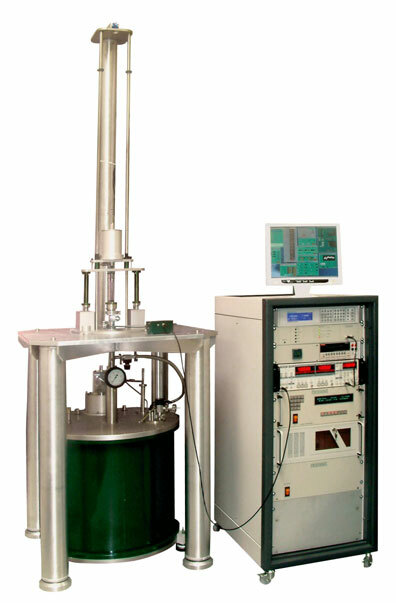 The calorimeter operates in low temperature exchange gas and is enclosed in a chamber with access via a conical seal. The sample is mounted using Apieson grease to the calorimeter chip. The normal temperature range is 5 to 300K. - Low amplitude of temperature oscillations and hence high temperaurte resolution (0.1K typically). - Fast measurements as the frequency of the temperature modulation is of the order of 10 to 100 Hertz. - Robust and durabile with reasonable care the lifetime of a single sensor can span over tens of sample replacements. - High sensitivity of 1 nJ/K through out the temperature range 5-300K. The Cryogenic QHR2000 is offered in collaboration with the UK National Physical Laboratory . The system has been developed to meet the needs of Standards Laboratories around the world for an improved level of accuracy in the calibration and maintenance of primary resistance standards. It provides the ability to resolve and measure currents and resistance values to an accuracy of 10-9. The QHR systems are configured for both Quantum Hall Metrology and research on QHE devices and other materials. Cryogenic offers several versions of the QHR2000 to suit different applications and budgets. The standard 2000 type unit has He-4 refrigeration to 1.5K for the sample. The higher resolution 2010 version features a superior Cryogenic Current Comparator (CCC), a higher field coil and a He-3 refrigerator to provide temperatures down to 0.3K. This unit is preferred for research applications, for instance, into the use of QHR for AC measurements. The QHR2000 consists of two major components. This provides an absolute value of resistance related to the von Klitzing constant of 25812.807 Ohms. To provide this reference, a Quantum Hall semiconducting device is maintained at 0.3K with a He-3 refrigerator within a high magnetic field. A superconducting magnet is used to generate a background field of up to 14 Tesla. Under these conditions the Quantum Hall plateaus of resistance are easily obtained. This allows two independent and isolated currents of different values to be compared and controlled with an accuracy of 10-9. The bridge circuit is balanced using a SQUID sensor as a null detector. This produces a differential voltage across the Quantum Hall device which is measured via a sensitive nanovoltmeter. The voltage generated is proportional to the difference in currents in the bridge circuit which may be directly related to the difference in the unknown and reference resistances.